If you are an instructor currently using or considering for use by your students our textbook, Complete Business Statistics 8/E by Aczel, and are interested in having an examination or desk copy of the book and/or access to the supplementary materials that accompany it, please complete the form below. As part of that process, you will be asked to agree with our policy of not selling or otherwise distributing these free materials. Thank you very much. 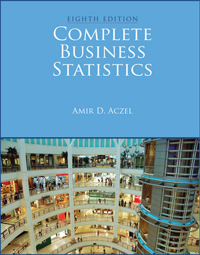 Examination and desk copies ofComplete Business Statistics 8/E by Aczel, as well as the ancillary instructor materials that accompany the text, are available only to instructors that have adopted or that are considering adopting the textbook for use by their students. Unauthorized selling, posting on a web site or other distribution of these materials would violate the intellectual property rights of the publisher and authors. Furthermore, it could have a significantly detrimental affect on the ability of other instructors to teach and assess their students in their own classes. Therefore, in requesting copies of these free materials, you are agreeing that you are a qualified instructor that has adopted, or that is considering adoption of, the textbook for your students, and that you will not sell, post on a web site or otherwise distribute these materials without written permission from Wohl Publishing.